Whether you are a professional athlete or make occasional trips to the gym, athletics can put a major strain on your body — particularly if you do a lot of weightlifting. This is why weightlifters need to pay close attention to their spine when they engage in intense exercise. By avoiding things like common safety tips and proper form, any person can end up doing serious damage to their back. With this in mind, here are some of the top tips for weightlifters to remember about spine safety whenever they work out. Before you start a strenuous workout, it is important to know the risks associated with weightlifting and back pain. There are a few different common types of back pain that can be caused by weightlifting including: strained ligaments in the upper back, muscle strain in the intercostal area of the upper back, lumbar strain in the tendons and muscles of the low back, and spinal misalignment. Spinal misalignment is the type of injury that can cause long-term back and neck pain. You are putting your body at risk for all of these thing when weightlifting, and knowing the risks can help you to be more aware of injuries when they first occur so that you can address them as needed and prevent them from going untreated and developing into more serious problems. One of the best things you can do in order to protect your back while lifting weights is to always use your core. Keep your abdominal muscles tense and engaged whenever you are lifting weights. This will not only help improve your posture, but it will also help prevent you from using the wrong muscles to lift weights. If you get to a point where you can no longer engage your abdominal muscles during lifting, it is time to call it a day. When you are lifting heavy weights, it is important to keep your spine straight. Do not arch your back. You may think this feels more comfortable at first, but it can cause nerve damage or tingling in your arms and legs. Make sure that you are not twisting your back when lifting either, as this can bring other muscles into the activity and cause you to strain more tendons and muscles as you work out. So many back injuries occur simply because the person lifting weights was using the wrong amount of weight during their workout. 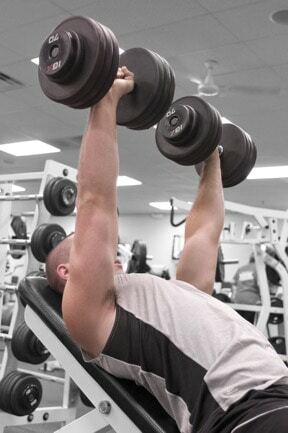 Remember: when it comes to toning and building muscle, heavier weights are not necessarily better. You can still get in a great workout if you use lighter weights. If the weight is too heavy for you then do not push yourself just because you think it will deliver better results. A lighter weight can give you just as much definition in your muscles and won’t come with as many risks. Knowing when to stop is perhaps your most important tool to prevent back injuries while weightlifting. Once you are physically exhausted, it is time to stop. Try to stop your weight lifting session before this point, as being physically exhausted puts you at a very high risk for injury. Many times, people try to compensate for their exhaustion by using other muscles in their body to lift the weight, which can cause serious injuries not only in your back but in other muscles as well. Keep these tips in mind during your upcoming workout to make certain you are protecting yourself and your back and avoiding unnecessary pain and potential long-term damage.